The WHCC-35H High Hardness Conditioning System should be used in tandem with a whole house water filtration system if your water contains 8 grains or more of hardness. 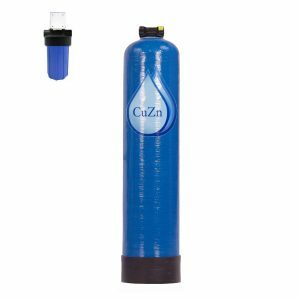 If your water is treated with Chlorine, use this system in tandem with the WHCC-35 or WHCC-35-DTF Wide Spectrum Whole House Systems. 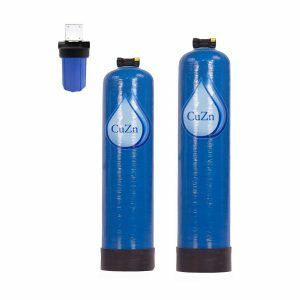 If your water is treated with chloramine, use this system in tandem with WHCM-47 or WHCM-47-DTF Chloramine Wide Spectrum Whole House Systems. Incredible 3-5 year capacity, simply replace the media in the system once every 5 years or when symptoms of hardness begin to return. The WHCC-35H will remove existing scale deposits so monitoring the performance visually works just fine. 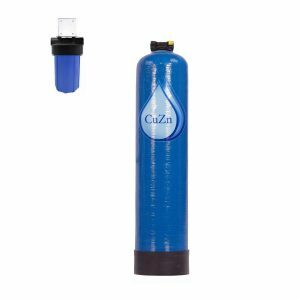 Salt Free Water Softening & Scale prevention! Unlike traditional salt based water softeners, CuZn’s Salt Free Systems won’t make your water feel slimy, have hair flattening effects, strip beneficial minerals or add salt to your water. 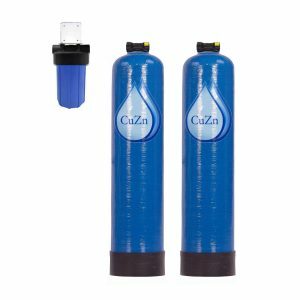 CuZn’s Salt Free Whole House Water Softener Systems utilize an entire tank of Template Assisted Crystallization Media and is an ideal choice for those with hardness above 8 grains. Replace the media inside the WHCC-35H every 5 Years, your system will be marked with the date of purchase for your reference.